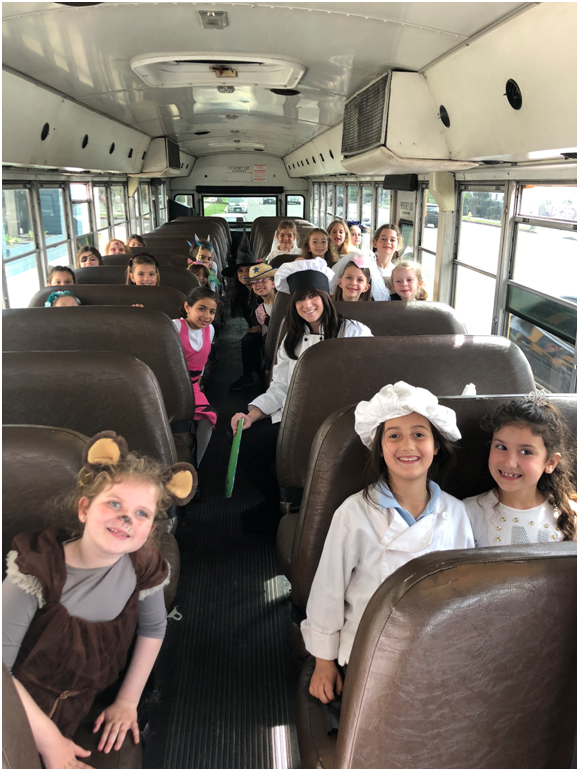 The yeshiva was buzzing with excitement on Tuesday, March 19th as each division participated in unique and exciting pre-Purim festivities- in costume of course! 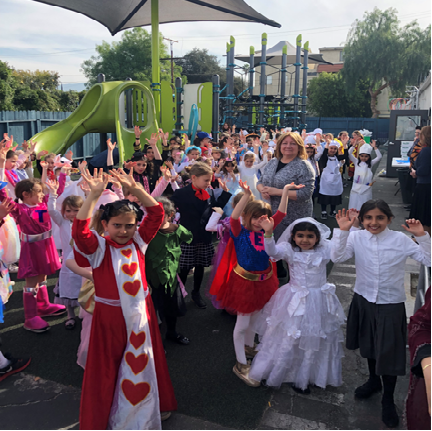 The Preschool got ready for Purim with a vibrant Arts Festival. Each child had the opportunity to journey through Purim themed stations and take home one-of-a-kind artistic masterpieces. Elementary boys and girls divisions were each treated to a 5 in 1 bounce house combo, bright Purim themed photo booth and fresh popcorn. 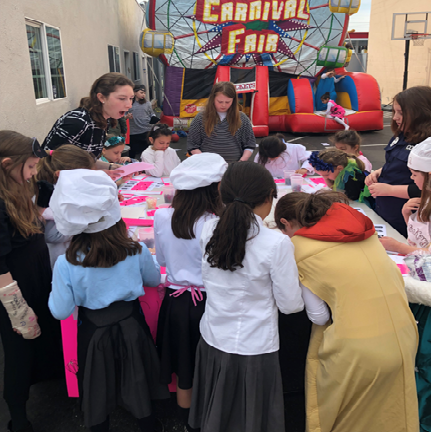 With thoughtful planning from Mrs. Esther Malka Heller and Mrs. Gitty Horowicz the girls classes were divided into groups mixed between older and younger grades as they went through 6 unique Purim stations. 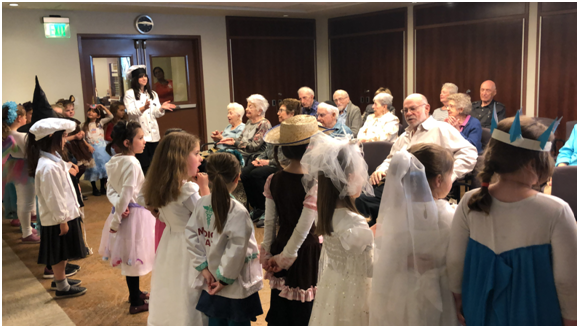 Morah Shaina Davidowitz and the 1G class had the added zchus of traveling to Eisenberg Village at the Jewish Home for the Aging, and visiting with the residents as part of Yeshiva Ketana’s ongoing partnership with the Steven Ohren Foundation. 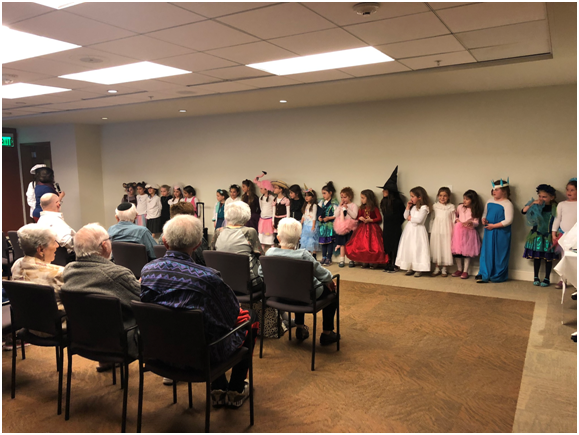 The girl’s told over the Purim story and entertained the residents proudly with their well-rehearsed Purim songs in English, Hebrew and Yiddish. Everyone had a beautiful day in advance of the Yom Tov of Purim. On Sunday, March 17th the sixth grade boys’ class chaperoned by their Rebbe, Rabbi Mandel, and class father’s Mr. Ari Friedman and Mr. Noah Weisman embarked on an achdus ski trip to Big Bear. Equipped with their winter gear and a whole lot of energy the boys headed to big bear for 24 hours of bonding and snow sports. They arrived to their rental home on Sunday afternoon and immediately settled in with a delicious BBQ dinner. That evening they made their way outside for a lively snowball fight. The boys woke up early on Monday morning to daven Shachris before they headed to the slopes where Rabbi Rubenstein joined them for the day. Experienced skiers immediately hit the mountain while newer skiers took lessons to AVOID hitting the mountain. What a memorable way for the boys to bond as a class! 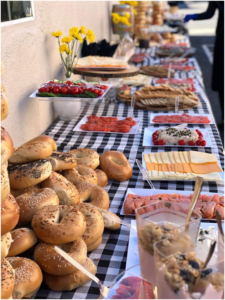 This past Sunday, our 3rd grade boys’ class, their fathers and even some grandfathers gathered together to mark the beginning of the boys’ learning Torah Sh’baalPeh with a beautiful and festive breakfast. The event began with Rabbi Davidowitz welcoming the children and their guests and describing the significance of LimudMishnayos. He then introduced our guest speaker, Rabbi AvrohomStulberger, Rosh Yeshiva of Valley Torah High Schools and proud zaidy of three (!) of our 3rd grade boys. 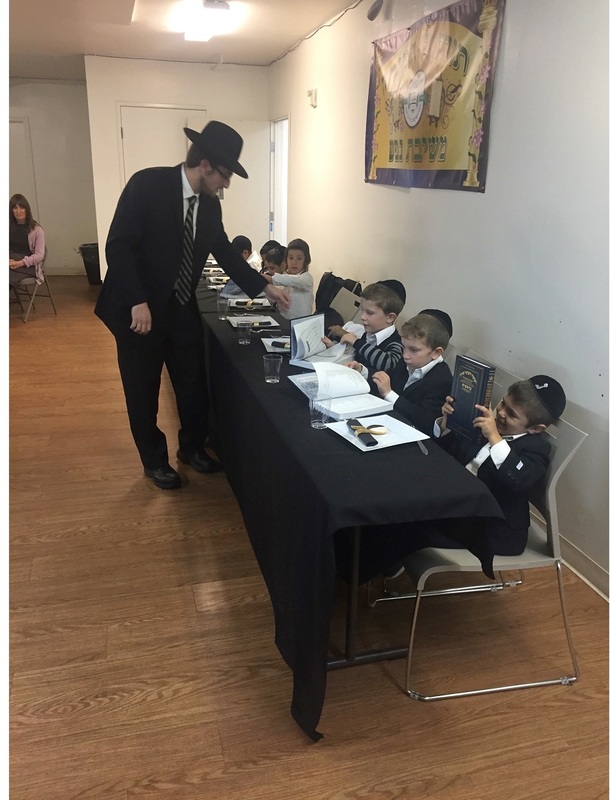 Rabbi Stulberger spoke about the chashivus of LimudHatorah and how events like these sweeten Torah learning for the boys for years to come. Rabbi Handwerger spoke next and then the boys began learning together, outlining the history of the Mishna and learning the 1stMishna of Brachos in unison. 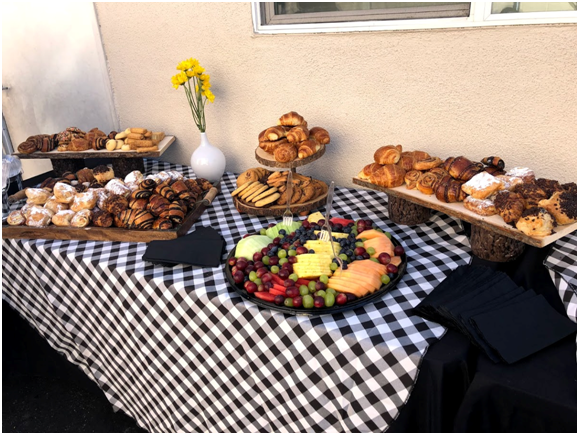 Everyone joined together for singing and dancing and then enjoyed the delicious breakfast buffet, prepared by our talented and dedicated PTA. 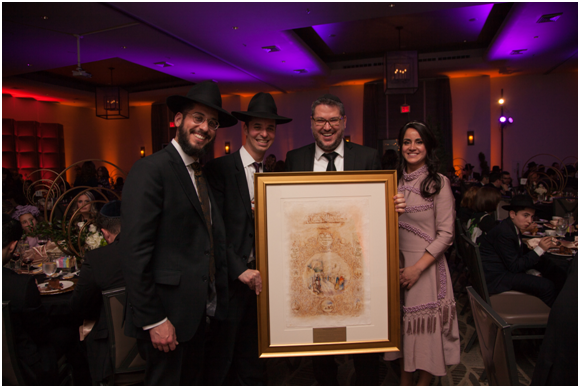 Thank you to all those that made this event possible and Mazal Tov to our boys – may you go on to become tremendous TalmideiChachomim! 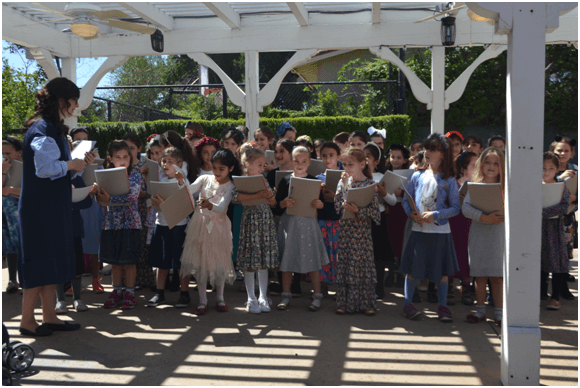 Last Thursday, November 8th, our elementary girls participated in a special assembly in honor of Rosh Chodesh Kislev. 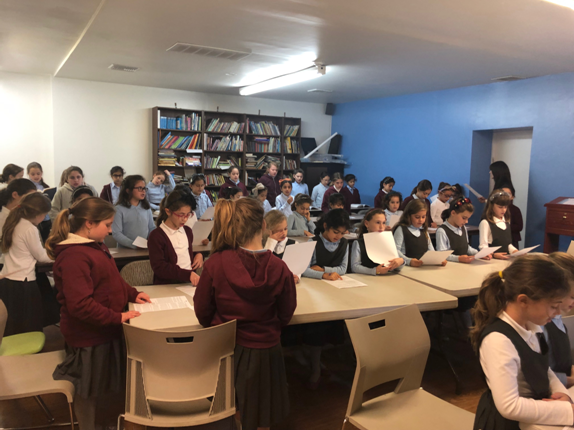 The 2nd-5th grade girls began their assembly with a join recitation ofHallel. 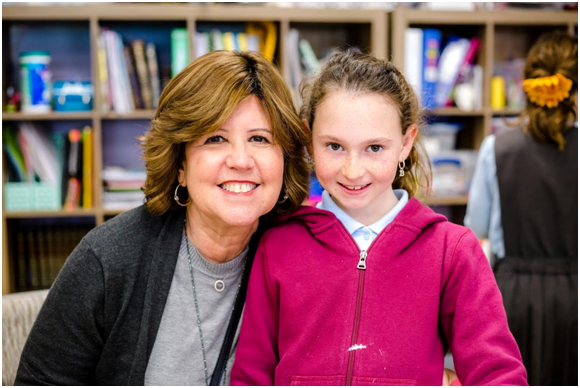 Mrs. Esther Malka Heller, our Elementary Girls Program Director, then introduced the girl’s to this year’s theme “One”derful Colors, a harmonious blend”. The girl’s played a lively game of pass-the-box as they learned about this month’s subject, “Grateful Green”. The assemblies concluded with the girls decorating thank-you cards, which they gave to someone to whom they are grateful. The Pre-1st and 1st grade girls had their assembly later in the afternoon. What a beautiful way to bring in the new Chodesh! 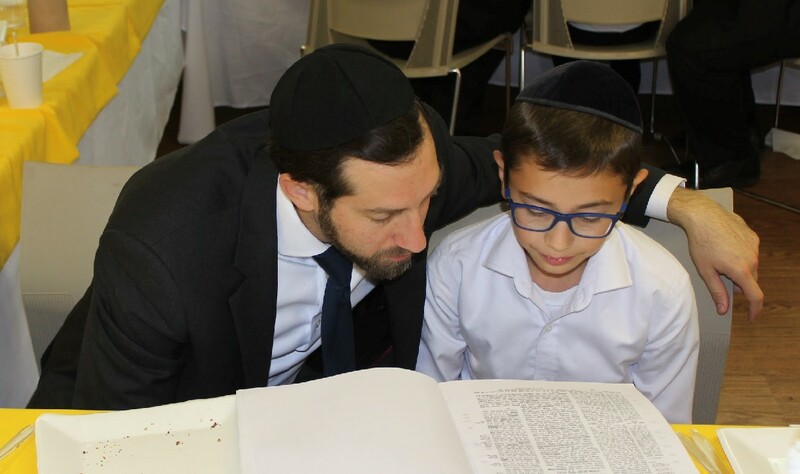 On Sunday morning, October 14th, our 5th Grade Boys class, together with their fathers and grandfathers, marked the formal beginning of their Gemara learning with a lavish breakfast. 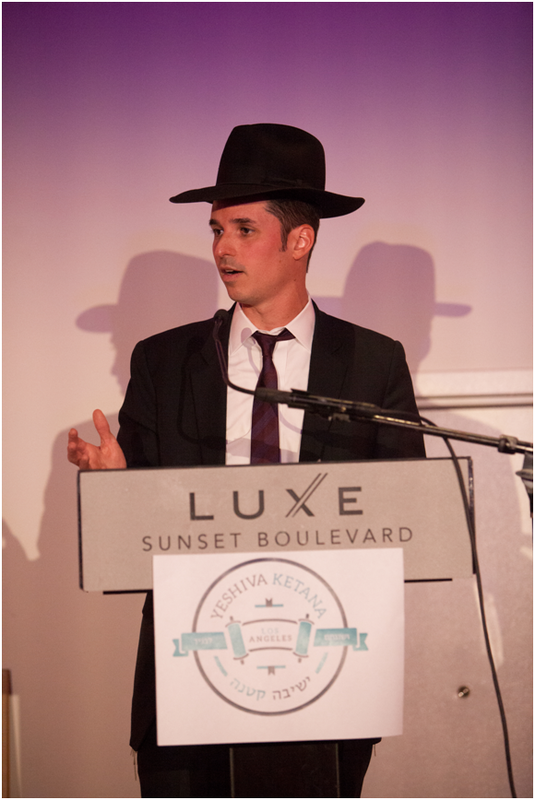 We were honored to have Rav Shlomo Gottesman, Rosh Yeshiva of Mesivta of Greater Los Angeles (“Calabasas”) join us at the Haschalas Gemara Breakfast and address the boys on the integral role that Limud Hatorah has in our Avodas Hashem. Rabbi Davidowitz and Rabbi Apter spoke as well, which was followed by father-son learning and spirited singing and dancing. 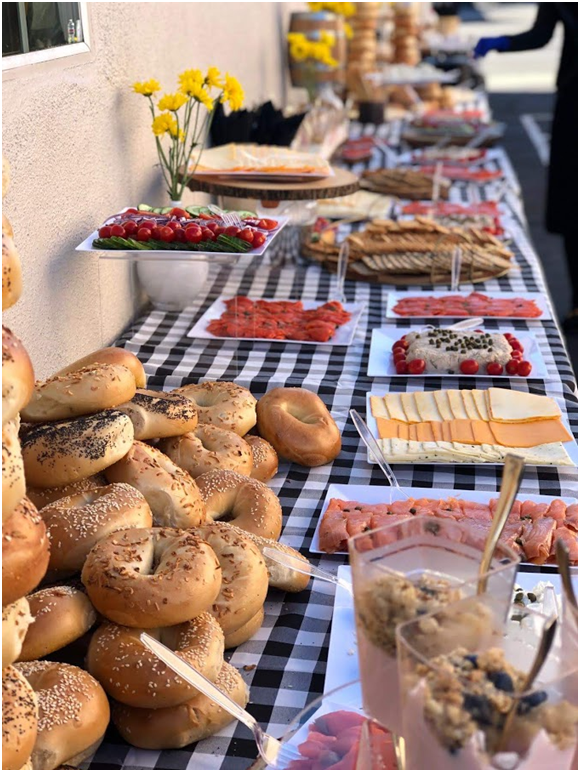 The work that our Rebbeim put into our Talmidim is clearly evident at events like this, and the work that our dedicated PTA volunteers put into making these events so aesthetically pleasing is on full display. Thank you to them, and to the parents of our Talmidim, who allow us to lead them on their journey through Torah! On Monday evening, October 15th, in the presence of their parents and grandparents, our 1st Grade boys received their Chumashim. 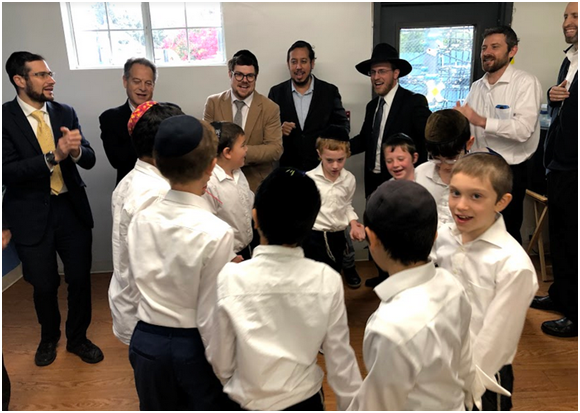 The 1st grade boys sang a song to their special guests, Rabbi Davidowitz and Rabbi Mann addressed the boys after which they learned the first Pasuk of Bereishis together from their brand-new Chumashim. Lively songs and dancing were followed by a delicious catered dinner and a festive cake. Thank you to the PTA events committee for making the room’s decor reflective of this truly momentous evening. 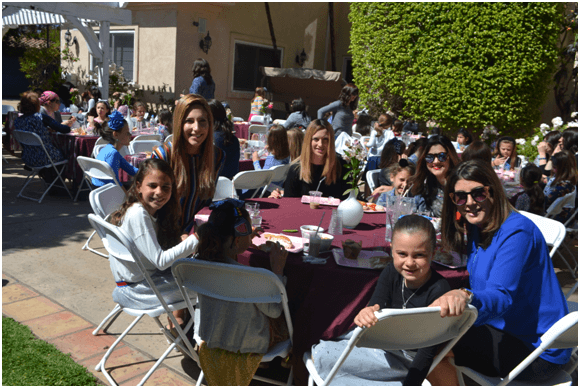 On Sunday, April 22, Elementary School Girls and their Mothers were treated to a beautiful Mother-Daughter Breakfast at the home of Irving and Linda Rubenstein. 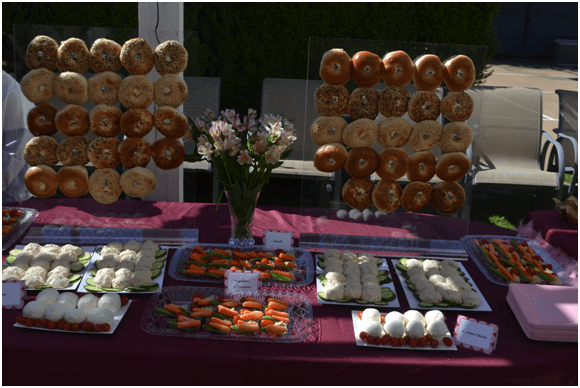 The program began with a continental breakfast that was both beautiful and delicious. During the breakfast Rabbi Rubenstein spoke to the attendees about the importance of proper chinuch and the invaluable partnership between the home and the Yeshiva in ensuring our daughters reaching their highest potential as Bnos Torah. The program followed with a heart-warming musical gift by the girls to their mothers as they sang “My Dear Ima”. Following the performance, the Mothers and Daughters decorated notebooks for each family to take home and use to write messages to one another. 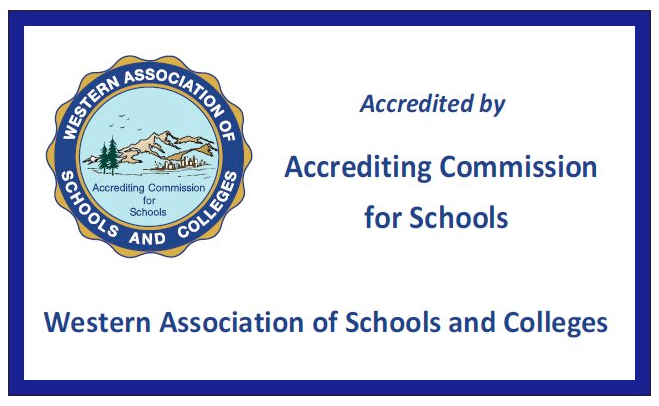 Thank you to the PTA for their hard work organizing and executing the event to perfection. Special thanks to Mr. and Mrs. Irving Rubenstein for again opening their home to the girls and their mothers. 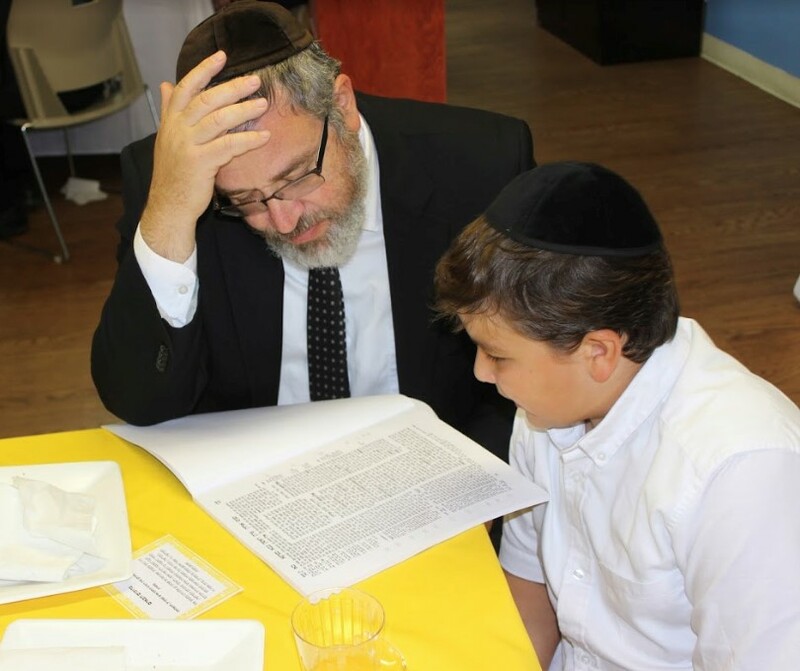 Torah Umesorah has long been at the forefront of Chinuch in America, serving as a valuable resource for Yeshivos across the country. 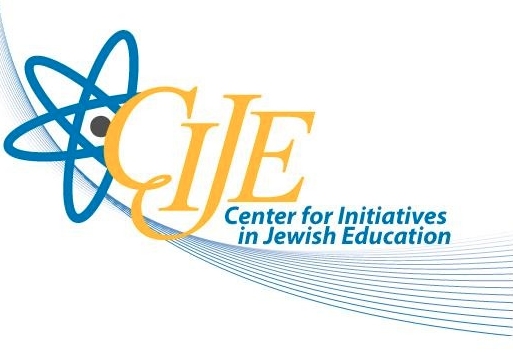 They support Jewish Education in so many ways including staffing, staff development and their amazing Teacher Centers, one of which we enjoy here in Los Angeles. 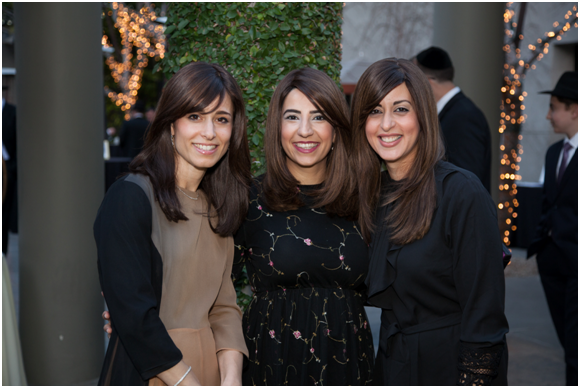 On Friday May 3rd, Morah Miriam Weiner was recognized at the Torah Umesorah National Leadership Convention with a prestigious award: the Mrs. Chaya Newman A”H Teacher Appreciation Award. This annual award is presented to an outstanding Morah, still in her first few years of teaching, who embodies the ideals of Mrs. Newman A”H. Mrs. Newman was a legendary Mechaneches who affected the lives of thousands of her own students and the students of her students with her warmth, caring and love. We are honored that Torah Umesorah and the thousands of attendees at the Convention recognized the amazing work that Morah Weiner does every day for the children of our community!